Kylie set her alarm at 6 am as she wanted to watch sunrise at the top of the island. But she was too tired and got up 30 minutes later. By the time she reached the viewing platform located outside Sanjokan, the sun had just risen above the horizon. Anyway, she took a lovely photo with a group of islands in the foreground. I opted for an onsen tour. 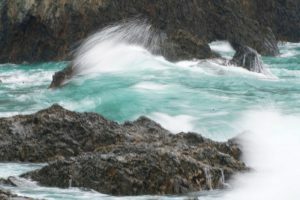 I began at Onsen Bokido watching waves beating the rocks, the drifting pink clouds and glowing sky, and the expansive Pacific Ocean. I sat in silence with a few Japanese ladies: we all enjoyed the beautiful scenery and gift of nature. Then I went into the small indoor Onsen Takinoyu pool. I did not stay long and moved onto Onsen Genbudo which, in my view, offers an even better view than Onsen Bokido. 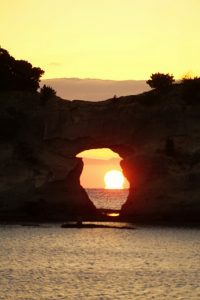 I was captivated by the rugged and rocky coast, a cave in a distance with an arch. I finished my tour at Onsen Isonoyu with crystal clear water in two pools. It is amazing to find each pool with different water quality. I can tell the difference: my skin was smooth, soft and silky after soaking in a couple of the pools. In order to enjoy the hot spring without endangering my health, I seldom immersed myself in the pool unless the water was not too hot. I also learnt to take cold shower or soaked myself in cold water. It’s fun! After breakfast, we checked out and spent an hour strolling on the hill top. We had awesome views of the surrounding islands, the coast and mountains on the mainland. We took the boat back to the port and picked up our car. We spent some time at the fish market which had already closed for the day. It is normally in full swing from 7 to 10-11 am. Anyway, we bought sashimi in a store before leaving the fish port. I have been to the Nachi Taisha Grand Shrine and Nachi Waterfall. I highly recommended Kylie to visit this scenic and spiritual area. 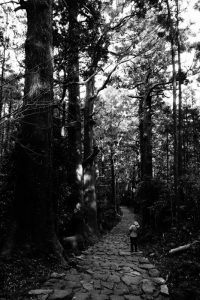 She preferred a short hike along the Daimon-zaka paved with stone and lined with massive evergreens. After parking our car above the waterfall, we took a stroll of 2.4km on the atmospheric Daimon-zaka (1.2km downhill and 1.2 km uphill). We had a coffee break. Kylie had a coffee while I had an icy cold beer. Kylie took a quick look at the waterfall which did not have much water. 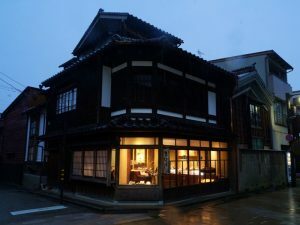 We intended to spend a night in an onsen hotel in Kumano. 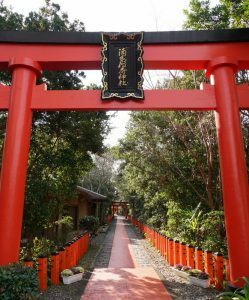 There are three famous onsen near the Kumano Hongu Taisha Grand Shrine. 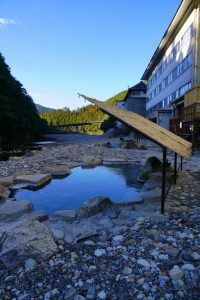 The Yuomine Onsen is said to be the oldest hot spring in Japan having been frequented for 1800 years. It is known for its therapeutic quality. 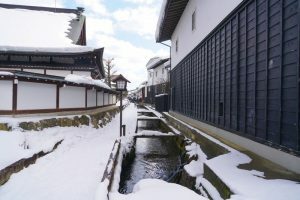 The Kawayu Onsen has hot water springs from anywhere one dig on the riverside. 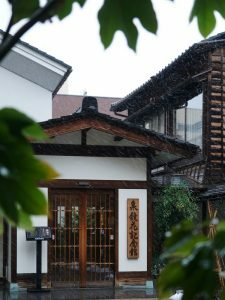 The Watase Onsen has a spa and hot spring pool in the narrow gaps between the mountains. We ended up spending a night at Hotel Kawayu Doriya, the same hotel I stayed on December 31, 2016. As it is the low season, we were put in a very nice comfortable room in the main building. As a loyal customer, the management kindly gave me a great price (¥11,500 pp for a twin room with two meals). We had an excellent and sumptuous dinner! 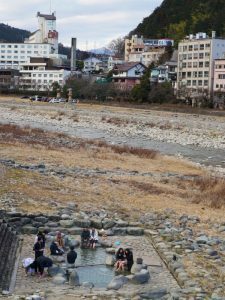 The outdoor onsen by the river is a treat. I could not wait to get into it again. I had a wonderful time and had the onsen to myself! We had a leisure day. 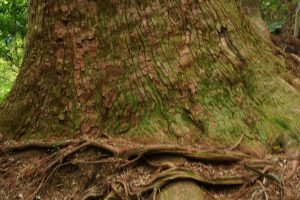 I began with a ten-minute soak in the outside onsen looking at the woodland and the river in front of me and breathing in fresh air. After a healthy breakfast, we set off after 9:30 am. 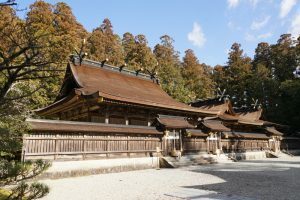 First we drove to Kumano Hongu Taisha Grand Shrine. On my first visit on New Year Day on 2017, the place was packed. Today, there were few worshipers but equally atmospheric. Then we had an onsen tour. We drove to the Yuomine Onsen and watched a few ladies boiled eggs with the 95°C water. A lady from Osaka gave two eggs to us to try. She is sweet. The Watase Onsen is less interesting. Kylie and I were glad that we had stayed in a nice hotel in Kawayu Onsen. Our tour would end the day afternoon. Today, we planned to visit Minabe known for its plum orchids and production of plum products. 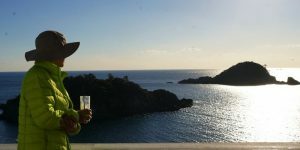 We booked a room at Hotel and Resort Wakayama Minabe for ¥9,000 which exceeded our expectations with fantastic view of the beautiful coast and the sea. We took R311 and arrived in Minabe in less than two hours. Unfortunately, the plum season would begin ten days later: we were too early. 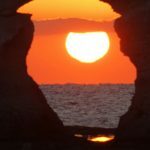 The weather was fine with all signs for a fantastic sunset. We were right! We drove to the Sunset Bay. 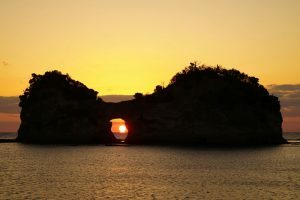 Many people were already waiting anxiously with their camera in hand or on tripod pointing at the Engetsu Island. I had been looking at tips on sunset photography. We had a perfect sunset at an iconic landmark. I tried a new setting but did not get it right. 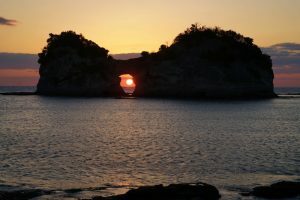 In the end, I failed to capture the magical moments when the brilliant red ball appeared inside the hole of the Eugetsu Island before disappearing below the horizon. Anyway, it is an unforgettable sunset. We tried to find a good restaurant for our last dinner on this trip. Somehow, the first restaurant we picked was close. The second was full. We drove on. When we arrived at a fish market by the road side, it was closing too. We drove and finally found another fish restaurant by road side open. We ended up spending ¥2,700 on sashimi and a seasonable seafood hot pot. While the sashimi was fresh and value for money, the hot pot with a tiny piece of chicken, a shrimp and a piece of fish, was a rip-off. Anyway, I ended my day in the onsen of the hotel. We did not set off till 10am. 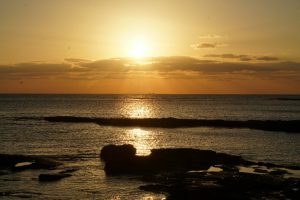 We planned to visit the Shirasaki coast and Wakayama on the way to the airport. 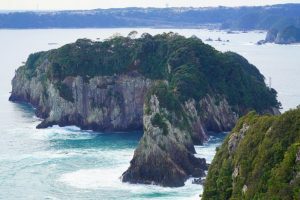 It took us an hour to reach the Shirasaki Coast which is lined with white rocks. 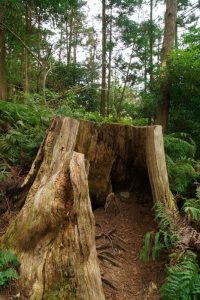 But the Shirasaki Kaiyo Park is closed owing to damage caused by recent typhoons. Instead of taking the toll road all the way to the airport, Kylie preferred to drive on the national road 42 which is less boring. As a result, we had a brief lunch stop and arrived at the airport car rental office just at 3pm. Perfect timing! But we did nothing but driving for four hours! We covered 2,662km in 14 days and paid ¥12,400 for petrol and 5,742 for toll fee. The Toyota office checked the car taking note of the slight damage at the bumper. After listening to our account and saw the hand-written note from the police, the staff told us not to worry and we would not be charged! 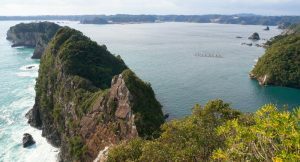 We were relieved and appreciated their understanding why we could not have made a report in Iya, Shikoku. 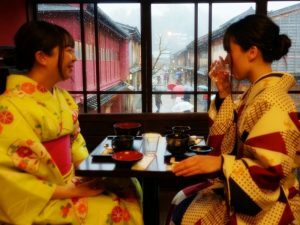 After Kylie returned to Hong Kong, I would travel on my own for six days on a 5-day Takayama-Hokuriku Area Tourist Pass (¥14,000). After returning the hire car and saying good-bye to Kylie, I went to the JR office where I redeemed the train voucher. With a 5-day pass in hand, I hopped on the 3:44 pm fast train to Kyoto. Had I known we would have had no trouble with the hired car which might take time to sort out, I would have taken a train to Kanazawa direct skipping Kyoto. Anyway, I have stayed in and know the area around the Kyoto train station fairly well. Hence, I booked a room at Hotel Keihan Kyoto Grande (over ¥6,200 for a single). I settled down comfortably in my room before 6 pm. I reserved a seat on the 8:41 am Thunderbird fast train to Kanazawa the following day. Then I started to look for ideas for dinner. There are countless eateries in the area. 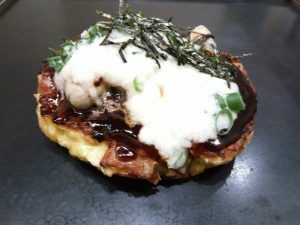 I picked a restaurant specialised in and ordered ‘yam and oyster’ okonomiyaki for ¥1,450. Apart from the three oysters, I could not tell what was in this pancake. I spent another hour wandering in a large food mall and some discount shops. Both were crowded. I then returned to my room and watched CNN for the first time on this trip. I also had time to write my travel notes. I slept so soundly that I missed the alarm at 7:30 am. Luckily, I woke up before 8 am and was at the platform by 8:20 am. That is the beauty to stay close to the train station. 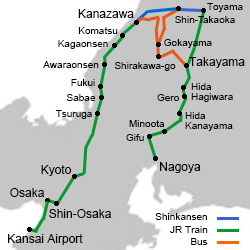 The train left on time and the scheduled time of arrival in Kanazawa was around 11 am. I had a scenic ride once the train pulled out of the station. The countryside was pretty covered in snow while the snow-cladded hills were veiled in mist. I felt comfortable and had time to enjoy the landscape and scenery. I also took my computer and continued with my travel notes. Time passed quickly. 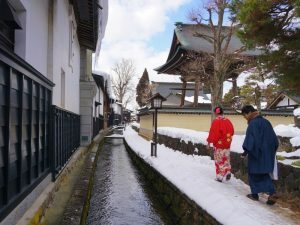 Suddenly, I heard the announcement of the next stop “Kagaonsen” which I had thought of spending a night instead of Kyoto. I packed up and got off the train around 10:30 am planning to spend half a day in this famous onsen region before taking a train to Kanazawa. It turned out to be a bad decision. A local bus takes visitors from the train station to the three onsen towns: Yamashiro, Yamanaka and Kayano. 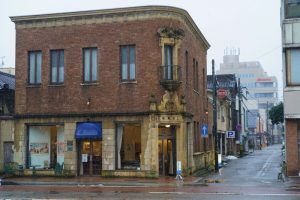 I approached the tourist information centre for maps and information. The lady told me the bus to the Yamanaka onsen (¥250 one way) just left at 10:40 am and the next one would be at 11:30 am. The weather was changing and turned grey and wet. If I stayed on, I had to store my luggage (¥600) and wait. It’s too much trouble and too cold. I immediately decided to take the next train to Kanazawa. Luckily, I caught a local train leaving at 10:57 am and arrived in Kanazawa around 11:30am. Had I missed this train, I would have had to wait half an hour for the next train! 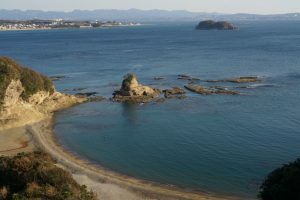 Kanazawa金沢市 located in north-western Ishikawa Prefecture in the Hokruiku region and bordering the Sea of Japan to the west and Toyama Prefecture to the east. The eastern portion of the city is dominated by the Japanese Alps. 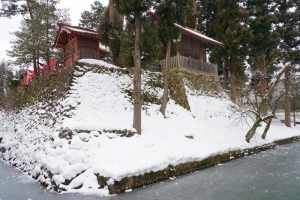 The most famous attraction of the city is Kenrokuen Garden which is considered one of the “three great gardens of Japan”. The city has many well – preserved areas with traditional architecture. 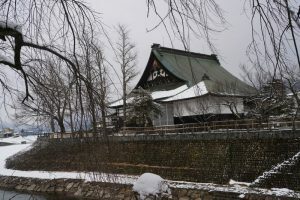 There are several notable areas for temples, geisha and samurai. I booked a night at Dormy Inn next to the train station. I went to the bus office and reserved a seat on the bus to Shirakawa-go at 9:10 am the next day. 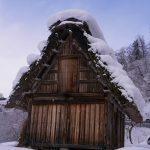 After spending a few hours in this picturesque World Heritage Site known for its gassho huts, I would go to Gero where I had already reserved an onsen hotel a couple months ago. As I could not check in till 3 pm, I went out after putting on my rain pants and more layers. It was raining and freezing. 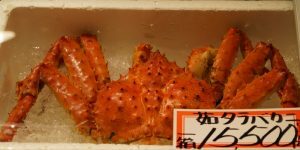 My first destination was the famous and vibrant Omi-cho Market where I had a seafood feast. 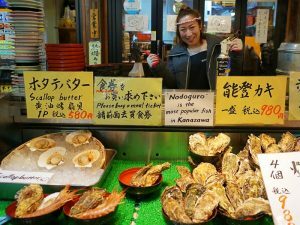 After having a bowl of rice with sashimi (¥2,500), I had two fresh oysters (¥1,200) and a plate of steamed and grilled shrimps, an oyster and a scallop (¥980). It was miserably wet and cold. Though I had no umbrella, I was dry with my waterproof jacket and pants on. I decided to walk to the Higashi Chaya District. On the way, I saw several hair salons and finally decided to have a hair-cut. I picked one that was run by a couple. The listed price was ¥3,800. The barber seems impressed that I am still travelling on my own at my age. 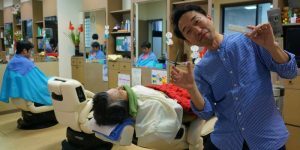 At the end, he only charged me ¥3,000. Soon, it started to snow. It’s atmospheric. 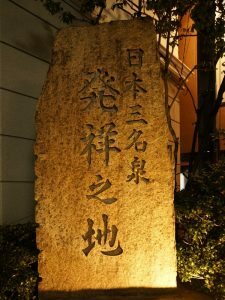 I walked aimlessly through the Kazua-machi Chaya District, passed by the Yanagi Sori Design Memorial, crossed the Asanogawa Ohashi Bridge before arriving at my destination. It was snowing heavily. The district is full of coffee shops, dessert houses, restaurants and souvenir shops. I was cold and took refuge in a dessert house / coffee shop where I had a traditional thick red bean soup with five rice dumplings for ¥950. Two pretty young ladies in kimono from Tokyo, set next to me. I sought their permission and took some lovely photos. I had visited this district on my first visit 20 years ago. 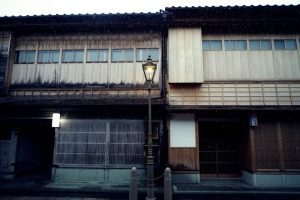 I love the wooden buildings with beautiful lattices. There were few tourists. The streetscape, buildings and snow were magical in creating an atmospheric and timeless old town. I was in a good mood. 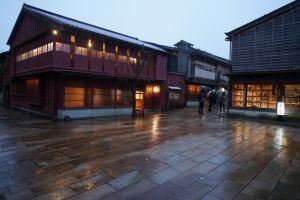 If the weather were fine, I would have taken the architectural trail to revisit other parts of Kanazawa. Anyway, I walked back to the hotel and checked in after 7 pm. I had a relaxing evening. 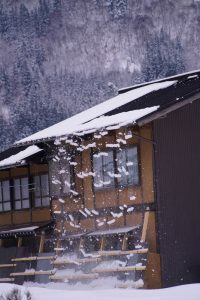 I spent half an hour in the onsen with water coming from Kagaonsen. I felt good and my skin was smooth. The hotel provides free beer and wine from 6 to 9 pm and noodles after 9:30 pm. I had a beer, two glasses of red wine and a small bowl of noodles. I had a relaxing day as I did not need to keep my eyes on the GPS. I spent over six hours on my feet instead of sitting inside a car. No doubt I was exhausted and went to bed shortly after 10 pm. I got up before 6:30 am after an excellent sleep. I had a coffee and a sandwich before boarding the bus to Shirakawa-go. There were so many passengers that two buses instead of one left at 9:10 am. 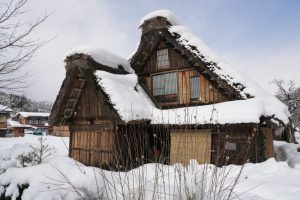 The bus took the expressway and I found myself in a white wonderland all the way to Shirakawa-go. I arrived at my destination at 10:35 am. After storing my luggage for ¥500, I spent a couple of hours wandering around. I was here on April 22, 2013 for cherry blossom with the distinctive gassho huts in the foreground and mountains as the backdrop. I returned to see its postcard winter scene. Unfortunately, the place is now overflow with tourists. Most of them are Putonghua speaking Chinese from the Mainland. They might be overwhelmed by the beauty and get overexcited. They were noisy and spoilt my mood. It’s time to leave to get away from the crowd. I took the 1:15 pm bus to Takayama and waited for a connecting train scheduled for 2:40 pm. I arrived in Gero 下呂 around 3:30 pm. 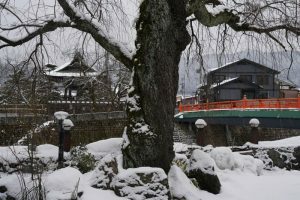 Gero, a small town by the Hida River with a dramatic mountainous setting, has been known for its hot springs since the 10th century. It is one of Japan’s “Three Famous Springs” along with Arima Onsen near Kobe and Kusatsu Onsen in Gunma Prefecture. Its waters are said to be particularly good for relieving neuralgia, skin complaints and rheumatism. There are free open-air spas on the rocky river banks of the river and some foot baths in town. 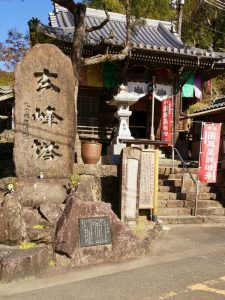 The town was flattened by an earthquake in 1265 which caused the main hot springs to dry up. Legend has it that a white heron led the villagers to a new source of gushing hot water near the Mashita River. 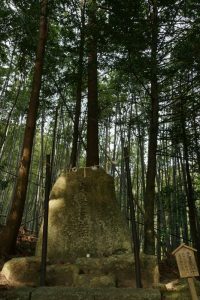 The bird then settled in a pine tree, at the foot of which was an image of the Buddha. 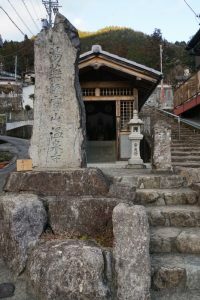 Inhabitants therefore built a temple which is now the Onsenji Temple. 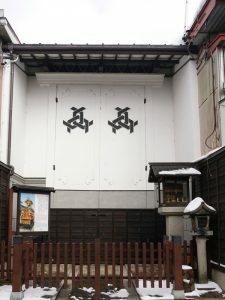 The white heron has become Gero’s main symbol. I took a free shuttle to the Bosenken Hotel nested on the hillside across the river. 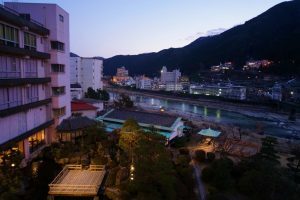 I had a large Japanese style room for ¥7,440 with breakfast and a fabulous view of the town below, the river and the surrounding mountains. This is an excellent weekday price in low season. The first thing I did was to make tea, had a biscuit and sat in front of glass window. I did nothing and emptied my mind for half an hour. Next I made my way to the onsen with two outdoor pools and an indoor pool. I find the water soft, smooth and not too hot. I soaked in the outdoor pool enjoying full views of the river valley. I like Gero and the Bosenken Hotel. I decided to spend one more night in the hotel but the weekend rate was much higher. In the evening, I spent an hour wandering around and looking for a nice place to stay the following day. It was not easy to find a single room during the weekend. At the end, I found a room in a minshuku near the train station. I spent another 15 minutes in the onsen before having breakfast at 7:30 am. The outdoor onsen is excellent especially in early morning. I watched sunrise. I took the free shuttle bus at 9:15 am to the train station and left my luggage in the minshuku before taking the 10:15 am train to Hida-Furukawa, a city I fell in love on my first visit some 15 years ago. 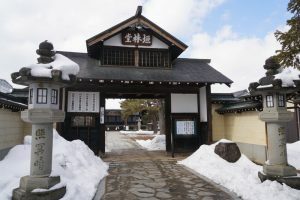 Hida Furukawa was established as a castle town in 1589: the Masushuma Castle was built by Arisige Kanamori (the 2nd generation of Nagachika Kanamori who had ruled Hida region during provincial wars). 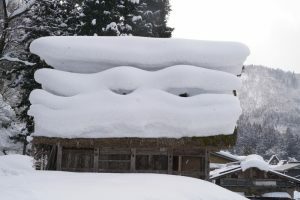 It was the only flat castle in Hida region. 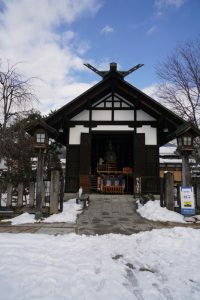 The town is famous for the Furukawa Festival that heralds the arrival of spring. 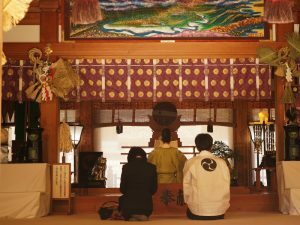 This is an annual celebration of the Ketawakamiya Shrine. Okoshi-daiko ‘rousing drum’ is performed on the night of April 19. During the parade, 12 neighbouring groups of men follow the main drum with their small drums called Tsuke-daiko (attaching drum). A Yatai Parade with nine exquisite floats taking place on April 20 is another highlight of the Furukawa Festival. The Furukawa Festival Exhibition Hall tells visitors about the festival. The town is atmospheric and enchanting with a distinctive townscape. 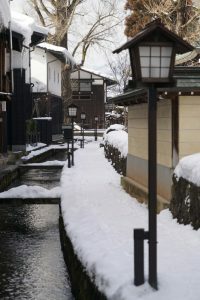 Traditional town houses stand in a row, a canal and three large temples namely Shinshuiji, Honkouji and Enkouji. After getting off the train after 11 am, I walked towards the ruins of the Masushima Castle. 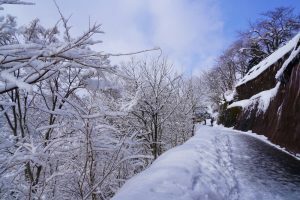 I was alone walked through deep snow. There was no footprint on the snow. It’s beautiful and peace! The town seemed to be in hibernation. I did not see a soul after walking for half an hour till I reached the Arai-gawa River. 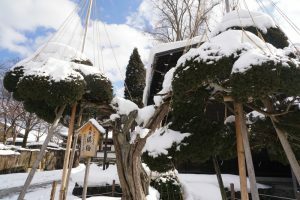 The tranquillity and snow white scenery are most captivating. I wandered around aimlessly. I followed the river passing by several Yatai-gura (Festival Float Storehouses). 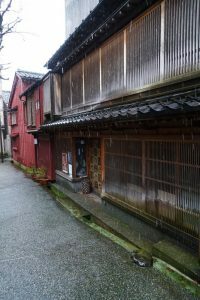 I stopped at a beautiful old house by the Kasumi Bridge. 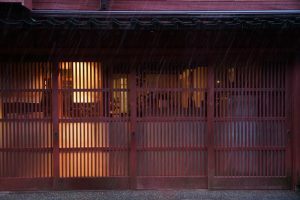 I went in and found out it’s a ryokan called Yatsusankan. 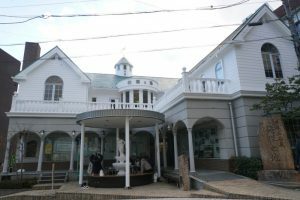 The minimum rate is ¥26,000 pp for accommodation, dinner and breakfast. If I return one day, I love to stay here. I stood by the Imamiya Bridge gazing at the Shinshuji Temple for 15 minutes. There was no noise, no traffic, no tourist…It’s unearthly beautiful. 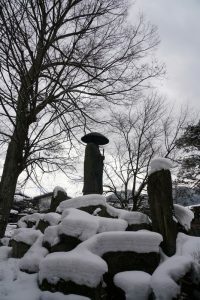 I went to all the temples which were closed. I took extra care as I did not want to slip and break my ankle. After wandering for over an hour, I stopped at a local eatery near the Festival Square and had a set vegetable lunch for ¥1,000. Near the square is the iconic Setogawa Canal and the White Walled Storehouse Street. The sun had come out and there were a few tourists strolling along the canal. 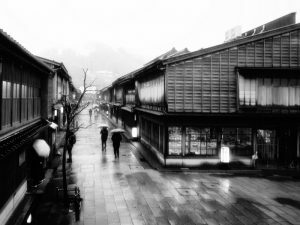 For me, Furukawa in winter is even more atmospheric and beautiful. I took the 2 pm train back to Gero as I wanted to visit a few places in Gero before dark. Once back in Gero, I checked in the minshuku with seven rooms. It is small but clean. 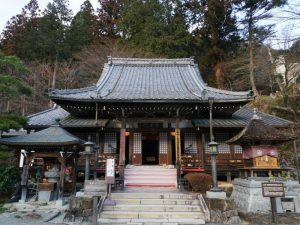 I visited the Onsenji Temple which affords a nice view of the town. 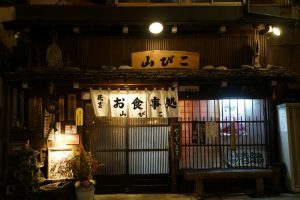 I had an excellent dinner in a small family-run restaurant located next to the Shirakaba Hotel. The place was mentioned to me by a local. The dinner set with four pieces of Hida beef and three river trout cost ¥2,000. The beef is tender and tasty. I ended my wonderful day by watching fireworks from the bridge. 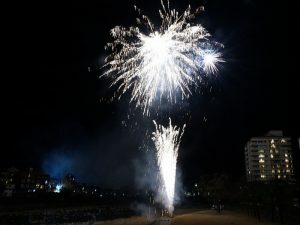 The tourism authority arranges ten-minute fireworks every Saturday in January and February.